Despite a jam-packed schedule, the last week was a relatively quiet one for area players. The other highlight came when Andrew Wenger, the 2012 MLS SuperDraft first pick and Lancaster, PA native, punched his ticket to the CONCACAF Champions League. Last Wednesday, just days after Wenger again scored against the Union, he and his Montreal teammates took on Vancouver in the Canadian Championship. With both team looking to make the jump to continental play and this the only chance for one of the three MLS teams in America’s hat to qualify for the Champions League (yep, if your team is from Canada and wins the MLS Cup or Community Shield it doesn’t help you one bit—look it up), everything was on the line. After starting all four matches of the tournament, Wenger turned in a solid 90 minute performance as his team drew 2-2 in the final with the Whitecaps in Vancouver. Though only a draw, it was enough for the Impact to claim the Championship and Canada’s only spot in the Champions League. Along with Wenger, fellow area player Zarek Valentin will also get a chance to feature in the tournament, assuming he returns to the Impact after his loan spell with Norway’s FK Bodø/Glimt ends at the end of the season. Chris Albright, D, Philadelphia Union — In the 18, but did not play. Season: 1 game, 1 clean sheet. Greg Cochrane, D, Los Angeles Galaxy — Started and played 90 minutes in Sunday’s 5-0 loss at New England. Season: 9 games, 6 starts, 2 clean sheets. Bobby Convey, M, Toronto FC — Started and played 90 minutes in Saturday’s 1-1 draw with Philadelphia. Season: 5 games, 3 starts. Ryan Finley, F, Columbus Crew — Did not play. Season: 4 games. Dan Gargan, D, San Jose Earthquakes — In the 18, but did not play. Season: 4 games, 4 starts, 1 assist, 1 clean sheet. Corey Hertzog, F, Vancouver Whitecaps — Did not play. Season: 4 games, 3 start, 1 goal. Antoine Hoppenot, F, Philadelphia Union — Played 19 minutes in Saturday’s 1-1 draw at Toronto. Season: 12 games, 1 goal, 1 assist. Jeff Larentowicz, M, Chicago Fire — Started and played 90 minutes in 2-0 win over D.C. Season: 11 games, 11 starts, 1 goal, 1 assist. Jeff Parke, D, Philadelphia Union — Started and played 90 minutes in Saturday’s 1-1 draw at Toronto. Season: 11 games, 11 starts, 1 clean sheet. Ryan Richter, D, Toronto FC — Started and played 90 minutes in Saturday’s 1-1 draw with Philadelphia. Season: 8 games, 7 starts, 0 clean sheets. Marcus Tracy, F, San Jose Earthquakes — Did not play. Season: 3 games. Bobby Warshaw, D, FC Dallas — In the 18, but did not play. Season: 7 games, 1 start, 1 clean sheet. Andrew Wenger, F, Montreal Impact — Played 1 minute in Saturday’s 2-1 win at Kansas City. Season: 9 games, 4 starts, 1 goal, 3 assists. Chris Albright, D, Philadelphia Union — Did not play. Tournament: 0 games. Tyler Bellemy, D, Rochester Rhinos — Started and played 90 minutes in Tuesday’s 5-1 loss to New England. Tournament: 1 game. Keasel Broome, GK, Ocean City Nor’easters — Did not play. Tournament: 1 game, 1 start, 1 assist, 0 goals against, 1 clean sheet. Shane Campbell, D, Reading United A.C. — Did not play. Tournament: 0 games. Greg Cochrane, D, Los Angeles Galaxy – Started and played 90 minutes in Wednesday’s 2-0 loss to Carolina. Tournament: 1 game, 1 start, 0 clean sheets. Kevin Curran, D, Ocean City Nor’easters — Started and played 90 minutes in Tuesday’s 2-1 loss to Philadelphia. Tournament: 3 games, 3 starts. Jonny Dolezal, D, Reading United A.C. — Started and played 90 minutes in Wednesday’s 2-0 loss to New York. Tournament: 3 games, 3 starts, 2 clean sheets. Ryan Finley, F, Columbus Crew — In the 18, but did not play. Tournament: 0 games. Dan Gargan, D, San Jose Earthquakes — Started and played 90 minutes in Tuesday’s 1-0 loss at Charleston. Tournament: 1 game. Antoine Hoppenot, F, Philadelphia Union — Played 9 minutes in Tuesdays 2-1 win over Ocean City. Tournament: 1 game. Duke Lacroix, M/F, Ocean City Nor’easters — Started and played 90 minutes in Tuesday’s 2-1 loss to Philadelphia. Tournament: 3 games, 3 starts, 1 goal. Jeff Larentowicz, M, Chicago Fire — Played 45 minutes in Wednesday’s 2-0 win at Charlotte. Tournament: 1 game. Darius Madison, F, Reading United A.C. — Did not play. Tournament: 2 games, 1 start, 1 goal. Dante Marini, M, Reading United A.C. — Played 17 minutes in Wednesday’s 2-0 loss to New York. Tournament: 2 games. Jarred Martinelli, F, Reading United A.C. — Did not play. Tournament: 0 games. John McCarthy, GK, Reading United A.C. — Started and played 90 minutes in Wednesday’s 2-0 loss to New York. Tournament: 3 games, 3 starts, 2 goals against, 2 clean sheets. Billy McConnell, D, Reading United A.C. — Did not play. Tournament: 0 games. Steve Neumann, M, Reading United A.C. — Started and played 90 minutes in Wednesday’s 2-0 loss to New York. Tournament: 3 games, 3 starts, 1 goal. Jimmy Ockford, D, Reading United A.C. — Started and played 90 minutes in Wednesday’s 2-0 loss to New York. Tournament: 3 games, 3 starts, 2 clean sheets. Jeff Parke, D, Philadelphia Union — Started and played 90 minutes in Tuesday’s 2-1 win over Ocean City. Tournament: 1 game, 1 start. Keegan Rosenberry, M, Reading United A.C. — Started and played 90 minutes in Wednesday’s 2-0 loss to New York. Tournament: 3 games, 3 starts. Manolo Sanchez, M, Reading United A.C. — Did not play. Tournament: 2 games, 2 starts. Melvin Snoh, M, Reading United A.C. — Did not play. Tournament: 2 games. Frank Tweneboa, F, Ocean City Nor’easters — Started and played 87 minutes in Tuesday’s 2-1 loss to Philadelphia. Tournament: 3 games, 3 starts, 1 assist. Brad Vanino, M, Reading United A.C. — Did not play. Tournament: 0 games. Jamie Vasquez, F, Reading United A.C. — Did not play. Tournament: 0 games. Bobby Warshaw, D, FC Dallas — Started and played 86 minutes in Tuesday’s 2-0 win over Ft. Lauderdale. Tournament: 1 game. Jason Yeisley, F, Richmond Kickers — Started and played 12o minutes in Tuesday’s 0-0 (4-2 P.K.) loss to D.C. Tournament: 1 game. Corey Hertzog, F, Vancouver Whitecaps — Did not play. Cup: 2 games, 1 goal. Andrew Wenger, F, Montreal Impact — Started and played 90 minutes in Wednesday’s 2-2 draw at Vancouver. Cup: 4 games, 4 starts, 1 goal. Pat Hannigan, GK, San Antonio Scorpions — Started and played 22 minutes in Saturday’s 2-0 win over Minnesota, recording 1 save and 0 goals against. Season: 6 games, 6 starts, 20 saves, 11 goals against. Christopher Williams, D, San Antonio Scorpions — Did not play. Season: 4 games, 3 starts, 0 clean sheets. Jeremy Vuolo, GK, San Antonio Scorpions — Played 68 minutes in Saturday’s 2-0 win over Minnesota, recording 2 saves and 0 goals against. Season: 2 games, 1 start, 7 saves, 1 goal against. Tyler Bellemy, D, Rochester Rhinos — Started and played 90 minutes in Friday’s 2-2 draw with Los Angeles. Started and played 90 minutes in Saturday’s 3-0 loss at Pittsburgh. Season: 6 games, 5 starts. Thomas Brandt, D, Harrisburg City Islanders — In the 18, but did not play on Friday and Saturday. Season: 3 games, 2 starts. Tony Donatelli, M, VSI Tampa Bay — Played 20 minutes in Saturday’s 4-4 draw with the Portland Timbers Reserves. Season: 9 games, 8 starts, 1, goal, 1 assist. 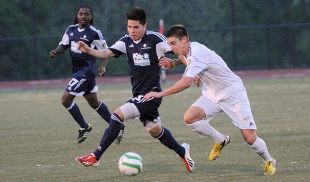 Cristhian Hernandez, M, Harrisburg City Islanders — In the 18, but did not play on Friday. Started and played 73 minutes in Saturday’s 4-0 win at Charlotte, scoring a goal in the 6th minute. Season: 8 games, 8 starts, 3 goals, 2 assists. Morgan Langley, F, Harrisburg City Islanders — Played 20 minutes in Friday’s 2-1 win at Charleston. Played 19 minutes in Saturday’s 4-0 win at Charlotte. Season: 8 games, 6 starts, 2 goals. Jimmy McLaughlin, M, Harrisburg City Islanders — Started and played 67 minutes in Friday’s 2-1 win at Charleston. Played 6 minutes in Saturday’s 4-0 win at Charlotte, scoring a goal in the 89th minute. Season: 7 games, 3 starts, 2 goals. J.T. Noone, M, VSI Tampa Bay — Started and played 90 minutes in Saturday’s 4-4 draw with the Portland Timbers Reserves, providing an assist in the 12th minute. Season: 9 games, 9 starts, 1 goal, 1 assist. Jason Pelletier, M, Harrisburg City Islanders — Started and played 90 minutes in Friday’s 2-1 win at Charleston. Started and played 90 minutes in Saturday’s 4-0 win at Charlotte. Season: 5 games, 5 starts, 2 clean sheets. Mike Seamon, M, Pittsburgh Riverhounds — Did not play. Season: 10 games, 10 starts. Andrew Welker, F, Harrisburg City Islanders — Did not play. Season: 1 game, 1 start. Jason Yeisley, F, Richmond Kickers — Started and played 60 minutes in Friday’s 1-0 win over Phoenix. Season: 5 games, 5 starts, 1 goal. Colin Zizzi, D, Harrisburg City Islanders — Started and played 67 minutes in Friday’s 2-1 win at Charleston. Started and played 90 minutes in Saturday’s 4-0 win at Charlotte. Season: 9 games, 9 starts, 1 assist, 2 clean sheets. Jon Okafor, M, MYPA — Started and played 90 minutes in Wednesday’s 2-1 loss to RoPS. Started and played 64 minutes in Sundays’ 1-0 loss to JJK. Season: 10 games, 4 starts. Alex DeJohn, D, Ekenäs IF — Started and played 90 minutes in Thursday’s 2-0 win over EsPA. Started and played 90 minutes in Sunday’s 2-0 win over Pallohonka. Season: 8 games, 8 starts, 5 clean sheets. Billy Schuler, M, Hammarby IF — Started and played 90 minutes in Sunday’s 1-0 loss at GIF Sundsvall. Season: 8 games, 6 starts, 1 goal. Anthony Allison, F, Umeå FC — Started and played 63 minutes in Saturday’s 5-1 win over Eskilstuna City FK. Season: 8 games, 7 starts, 1 goal, 1 assist. Just an idea, but it would be nice to see where these players are originally from as well. They’re obviously local, but where local.